This article is about the city in Indiana. For other cities and places with that name, see Lafayette (disambiguation). 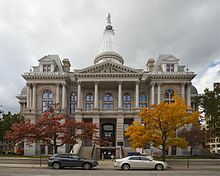 Lafayette (/ˌlɑːfiːˈɛt, ˌlæf-/ LAH-fee-ET, LAF-ee-ET) is a city in and the county seat of Tippecanoe County, Indiana, United States, located 63 miles (101 km) northwest of Indianapolis and 105 miles (169 km) southeast of Chicago. West Lafayette, on the other side of the Wabash River, is home to Purdue University, which contributes significantly to both communities. 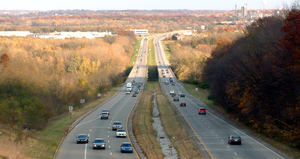 Together, Lafayette and West Lafayette form the core of the Lafayette, Indiana Metropolitan Statistical Area. According to the 2010 United States Census, the population of Lafayette was 67,140, roughly a 19% increase from 56,397 in 2000. Meanwhile, the 2010 U.S. Census pegged the year-round (excluding Purdue University students) population of West Lafayette at 29,596 and the Tippecanoe County population at 172,780. Downtown Lafayette and the Riehle Plaza & CityBus depot in August 2011. Lafayette was founded in 1825 on the south/east bank of the Wabash River near where the river becomes impassable for riverboats upstream, though a French fort and trading post had existed since 1717 on the opposite bank and three miles downstream. It was named for the French general Marquis de Lafayette, a revolutionary war hero. This panoramic map illustrates a bird's-eye view of Lafayette, Indiana, in 1868. When European explorers arrived at the area around what is now Tippecanoe County, it was inhabited by a tribe of Miami Indians known as the Ouiatenon or Weas. In 1717, the French government established Fort Ouiatenon across the Wabash River and three miles (5 km) south of present-day Lafayette. The fort became the center of trade for fur trappers, merchants and Indians. An annual reenactment and festival known as Feast of the Hunters' Moon takes place there each autumn. The town of Lafayette was platted in May 1825 by William Digby, a trader. 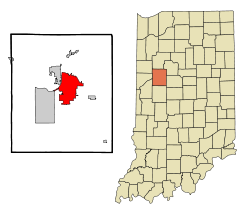 It was designated as the county seat of the newly formed Tippecanoe County the following year. Like many frontier towns, Lafayette was named for General Lafayette, a French officer who significantly aided George Washington's Continental Army during the American Revolutionary War. 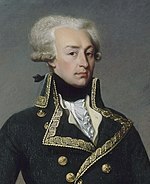 Lafayette toured the United States in 1824 and 1825. In its earliest days, Lafayette was a shipping center on the Wabash River. In 1838, Henry Leavitt Ellsworth, the first United States Patent Commissioner, published a booklet titled Valley of the Upper Wabash, Indiana, with Hints on Its Agricultural Advantages, to promote settlement of the region. By 1845, Ellsworth had purchased 93,000 acres (380 km2) of farmland in and around Lafayette and moved there from Connecticut to supervise land sales. By 1847 Ellsworth was distributing broadsides looking for farmers to purchase his farmland. He became president of the Tippecanoe County Agricultural Society in April 1851 – despite some local resentment over what was called "the Yale Crowd" – but he was defeated the same year when he ran for the Indiana House of Representatives. 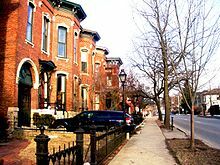 Ellsworth Street and Ellsworth Historic District are named for the early real estate developer. The Wabash and Erie Canal in the 1840s stimulated trade and affirmed Lafayette's regional prominence. Railroads arrived in the town in the 1850s, connecting it with other major markets. The Monon Railroad connected Lafayette with other sections of Indiana. Lafayette was the site of the first official air mail delivery in the United States, which took place on August 17, 1859, when John Wise piloted a balloon starting on the Lafayette courthouse grounds. Wise hoped to reach New York; however, weather conditions forced the balloon down near Crawfordsville, Indiana, and the mail reached its final destination by train. In 1959, the U.S. Postal Service issued a 7¢ airmail stamp commemorating the centennial of the event. In 1992, the Greater Lafayette area (Lafayette and West Lafayette) was the first place in Indiana to experience the internet during the initial college town connection launching. Lafayette is located at 40°24′38″N 86°52′29″W﻿ / ﻿40.410585°N 86.874681°W﻿ / 40.410585; -86.874681 (40.410585, −86.874681) and lies in Fairfield and Wea Townships. Elevation at the court house is 550 feet (168 m), but city elevations range from a little over 500 feet (150 m) at the Wabash River to approximately 700 feet (210 m) in the areas of Murdock Park and Columbian Park. According to the 2010 census, Lafayette has a total area of 27.74 square miles (71.85 km2), all land. In recent years, temperatures in Lafayette have ranged from an average low of 17 °F (−8 °C) in January to a high of 86 °F (30 °C) in July, although a record low of −33 °F (−36 °C) was recorded in January 1985 and again in January 1994; and a record high of 105 °F (41 °C) was recorded in June 1988. Average monthly precipitation ranged from 1.58 inches (40 mm) in February to 4.24 inches (108 mm) in June. 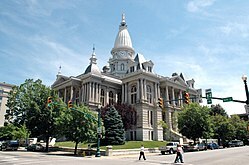 Lafayette is the larger principal city of the Lafayette-Frankfort CSA, a Combined Statistical Area that includes the Lafayette metropolitan area (Benton, Carroll, and Tippecanoe counties) and the Frankfort micropolitan area (Clinton County), which had a combined population of 212,408 at the 2000 census. As of the census of 2010, there were 67,140 people, 28,545 households, and 15,863 families residing in the city. The population density was 2,420.3 inhabitants per square mile (934.5/km2). There were 31,260 housing units at an average density of 1,126.9 per square mile (435.1/km2). The racial makeup of the city was 74.2% White, 11.2% African American, 0.4% Native American, 1 Asian, 0.0% from other races, and 2.7% from two or more races. Hispanic or Latino of any race were 16.3% of the population. There were 28,545 households of which 29.4% had children under the age of 18 living with them, 36.7% were married couples living together, 13.7% had a female householder with no husband present, 5.2% had a male householder with no wife present, and 44.4% were non-families. 34.9% of all households were made up of individuals and 9% had someone living alone who was 65 years of age or older. The average household size was 2.30 and the average family size was 3.00. The median age in the city was 31.9 years. 23.8% of residents were under the age of 18; 12.9% were between the ages of 18 and 24; 29.9% were from 25 to 44; 22.2% were from 45 to 64; and 11.3% were 65 years of age or older. The gender makeup of the city was 48.7% male and 51.3% female. 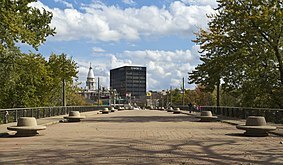 View of Lafayette from Main St bridge. As of the census of 2000, there were 56,397 people, 24,060 households, and 13,666 families residing in the city. The population density was 2,806.5 people per square mile (1,083.9/km2). There were 25,602 housing units at an average density of 1,274.1 per square mile (492.0/km2). The racial makeup of the city was 88.91% White; 3.22% African American; 0.37% Native American; 1.22% Asian; 0.04% Pacific Islander; 4.61% from other races, and 1.62% from two or more races. Hispanic or Latino of any race were 9.11% of the population. There were 24,060 households out of which 27.0% had children under the age of 18 living with them; 42.5% were married couples living together; 10.2% had a female householder with no husband present; and 43.2% were non-families. 33.2% of all households were made up of individuals and 9.4% had someone living alone who was 65 years of age or older. The average household size was 2.31 individuals and the average family size was 2.98. In the city, the population was spread out with 23.2% under the age of 18; 14.2% from 18 to 24; 31.3% from 25 to 44; 19.3% from 45 to 64; and 12.0% who were 65 years of age or older. The median age was 32 years. For every 100 females, there were 97.7 males. For every 100 females age 18 and over, there were 95.3 males. The median income for a household in the city was $35,859, and the median income for a family was $45,480. Males had a median income of $32,892 versus $23,049 for females. The per capita income for the city was $19,217. About 8.0% of families and 12.1% of the population were below the poverty line, including 15.8% of those under age 18 and 4.6% of those age 65 or over. The government consists of a mayor – elected in a citywide vote – and a city council which consists of nine members of whom six are elected from individual districts. Three members are elected at-large. K-12 public education in Lafayette is provided by the Lafayette School Corporation. The Tippecanoe School Corporation also administers county schools nearby. New Community School was a tuition-free elementary charter school (sponsored by Ball State University) located on the north side of Lafayette that permanently closed on December 31, 2016. Beacon Academy is a charter school located in West Lafayette. Journal & Courier. The newspaper, which serves the Greater Lafayette area, has its newsroom and offices located in downtown Lafayette. Journal & Courier also has its own printing services for itself and other papers in the region on the eastside of Lafayette. Purdue Exponent. Purdue University's independent student newspaper serves Purdue, West Lafayette, and Lafayette, and has its newsroom and offices located just off campus on Northwestern Avenue in West Lafayette. From 1953 until the 2016 launch of WPBI-LD, WLFI-TV had been the only "Big Three" (ABC, CBS and NBC—or, including Fox, "big four") commercial network television broadcaster in the Lafayette market. With the 2017 launch of WPBY-LD, local broadcasts of all "big four" networks became available. 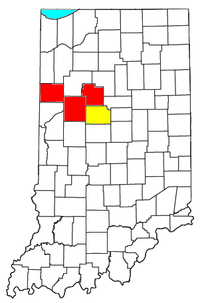 WRTV, WTHR, WTTV, and WXIN, the respective ABC, NBC, CBS, and Fox affiliates in Indianapolis which had been carried by cable and satellite providers in the Lafayette market as "out-of-market" stations, remain viewable in the area via a large over-the-air antenna or, in some cases, via a subscription satellite or streaming service. Cable provider Comcast Xfinity discontinued its remaining carriage of Indianapolis-based "big four" stations on March 7, 2018, but resumed carriage of WTHR and WRTV two days later. No airports are located within Lafayette city limits. The nearest general aviation airport is Purdue University Airport (LAF) in West Lafayette. The nearest commercial airport which currently has scheduled airline service is Indianapolis International Airport (IND), located approximately 60 miles (97 km) southeast of Lafayette in Indianapolis. Amtrak, the national passenger rail system, provides passenger rail service to Lafayette through the Cardinal to Chicago, Washington D.C., and New York City. Norfolk Southern; CSX; Kankakee, Beaverville and Southern Railroad; and Toledo, Peoria and Western Railway (RailAmerica) provide freight rail service. Many of the rail lines that originally passed through the downtown were redirected in the mid-1990s to a rail corridor near the Wabash River. Suburban Express operates weekend bus service between Purdue and Chicago Suburbs when Purdue is in session. Louise Fazenda – silent film comic actress, character actress in the "talkies"
John Korty – director, screenwriter, known for The Autobiography of Miss Jane Pittman and documentary Who Are the DeBolts? And Where Did They Get Nineteen Kids? Eric Carlson (musician) - lead guitarist, song writer and founding member of The Mentors. George Souders – won the Indianapolis 500 during his rookie season in 1927. 10 minutes North of Lafayette lies Prophet Rock, the landmark where the Prophet Tenskwatawa, the half brother of Tecumseh, stood watch encouraging the local Shawnee Native Americans to fight against the encamped army forces of William Henry Harrison in the Battle Of Tippecanoe in 1811. Tenskwatawa was a spiritual leader, but not a military man. His brother was out of town as the U.S. Army forces marched North, with hopes to destroy Prophetstown. Tenskwatawa had sought to have a meeting with Harrison to discuss how to avoid going to war. In the evening before the war, he sought a spiritual vision that led him to believe the assignation of Harrison must be done. Early in the morning of November 6, the warriors attacked Harrison's militia and war ensued. The warriors fell weak in supplies against the militia, and succumbed. Prophetstown was taken over where the militia stole supplies and burnt it down. The rock from where Tenskwatawa still stands over the battlefield, though now covered with much taller trees. You can access the rock by either scaling it from the small parking lot immediately in front or hiking the ridge line that leads to the top. The Martin Jenners headstone is located at the Spring Vale Cemetery in Lafayette. Jenners was a Civil War veteran who was known as the first white person born in Tippecanoe County and as an outspoken atheist. Originally located in Greenbush Cemetery, his headstone is unique because he had it placed in the cemetery fourteen years before his death, and it has the following inscription: "My only objection to religion is that it is not true. No preaching, no praying, no psalm singing on this lot." Jenners' headstone goes on mention two verses that he apparently believed to contradict each other, hence making the Bible untrue. The verses are I Corinthians 15:52, which talks about believers being raised from the dead "in a twinkling of an eye", and Isaiah 26:14, which states "They are now dead, they live no more; their spirits do not rise." The headstone received national attention at the time, despite attempts to have it removed, and it continued to draw visitors from around the country many years after his death. Jenners' headstone inscription has been cited by believers as an example of the Bible being taken out of context. Tombstone of Martin P. Jenners. Spring Vale Cemetery, Lafayette, Indiana. The old Temple Israel (Lafayette, Indiana) building at 17 South 7th St. is one of the oldest surviving synagogue buildings in the United States. Trinity United Methodist Church (formerly Trinity Methodist Episcopal Church – until 1969) – is the first church to have been started in the Lafayette, Indiana, area. Its current building was erected in 1869 by William Heath and has remained intact to this day. Tippecanoe Mall is the main shopping center. Lafayette has two sister cities as designated by Sister Cities International. ^ a b c "American FactFinder". United States Census Bureau. Retrieved 2008-01-31. ^ "Lafayette, Indiana". Geographic Names Information System. United States Geological Survey. Retrieved 2016-07-25. ^ "Lafayette (city), Indiana – QuickFacts". United States Census Bureau. Archived from the original on 2012-08-04. Retrieved 2012-04-19. ^ "Feast of the Hunters' Moon". Tippecanoe County Historical Association. Archived from the original on 2009-06-20. Retrieved 2009-06-01. ^ During the period of Ellsworth's residence in Lafayette, two of his children came to national attention. His son Henry William Ellsworth was confirmed as United States chargé d'affaires at Stockholm, Sweden, in January 1846; and Ellsworth's daughter Annie suggested the words of the first telegraph message sent by her father's friend Samuel F. B. Morse in May 1844. ^ "G001 – Geographic Identifiers – 2010 Census Summary File 1". United States Census Bureau. Retrieved 2015-07-29. ^ "Monthly Averages for Lafayette, Indiana". The Weather Channel. Retrieved 2011-01-27. ^ "Monthly Averages for Lafayette, IN (47905)". The Weather Channel. Retrieved November 19, 2011. ^ METROPOLITAN STATISTICAL AREAS AND COMPONENTS Archived 2007-05-26 at the Wayback Machine, Office of Management and Budget, 2007-05-11. Accessed 2008-08-01. ^ MICROPOLITAN STATISTICAL AREAS AND COMPONENTS Archived 2007-06-29 at the Wayback Machine, Office of Management and Budget, 2007-05-11. Accessed 2008-08-01. ^ COMBINED STATISTICAL AREAS AND COMPONENT CORE BASED STATISTICAL AREAS Archived 2007-06-29 at the Wayback Machine, Office of Management and Budget, 2007-05-11. Accessed 2008-08-01. ^ "Home- Tippecanoe County Public Library". Tippecanoe County Public Library. Retrieved 4 April 2018. ^ "Downtown Library - Tippecanoe County Public Library". Tippecanoe County Public Library. Retrieved 4 April 2018. ^ "Wyandotte Branch - Tippecanoe County Public Library". Tippecanoe County Public Library. Retrieved 4 April 2018. ^ "Klondike Branch - Tippecanoe County Public Library". Tippecanoe County Public Library. Retrieved 4 April 2018. ^ "Lafayette, Ind. Gets Its Own ABC Affiliate". Broadcasting & Cable. Retrieved May 25, 2017. ^ "WPBI begins news broadcast, launches ABC affiliate". Journal & Courier. Retrieved May 30, 2017. ^ "Comcast kills last of Indy stations from Lafayette's cable lineup". Journal & Courier. Retrieved March 8, 2018. ^ "Comcast: Indianapolis broadcast stations back … at least for now". Journal & Courier. Retrieved March 9, 2018. ^ Online Live Bus timings updates Archived 2013-03-17 at the Wayback Machine, 2007-05-11. ^ "Eric Bruntlett Stats". Baseball Almanac. Retrieved December 27, 2012. ^ "PROPHET'S ROCK". Retrieved 2016-05-09. ^ "Martin P. Jenners." www.findagrave.com. Retrieved March 17, 2015. ^ "The Civil War: Jenners, Martin P." National Park Service. Retrieved January 12, 2015. ^ "76th Regiment, Indiana Infantry (30 days, 1862)." www.familysearch.org. Retrieved January 13, 2015. ^ "Oldest White Child Born in Lafayette Found Dead." The Indianapolis Star, December 23, 1919. www.newspapers.com. Retrieved January 16, 2015. ^ "OBJECT TO EPITAPH HE HAS CARVED ON HEADSTONE. SAYS THE BIBLE IS FICTION." The Indianapolis News, September 2, 1905. www.newspapers.com. Retrieved November 26, 2014. ^ "Tombstone Says Bible is False." Syracuse Telegram and Courier, September 29, 1905. www.fultonhistory.com. Retrieved January 16, 2015. ^ Jensen, Laurie. "Early Settler's Last Words Continue to Draw a Crowd." Archived 2015-01-18 at Archive.today www.roguehangar.com. Retrieved January 16, 2015. ^ Stone, Perry. "Using the Wrong Sword for the Wrong Battle." www.ministrytodaymag.com. Retrieved November 22, 2014. ^ Stone, Perry. Secrets From Beyond the Grave. Lake Mary, FL: Charisma House, 2010. ISBN 1616381574. Google Books. Retrieved November 22, 2014. ^ Stone, Perry. There's a Crack in Your Armor. Lake Mary, FL: Charisma House, 2014. ISBN 1621362485. Google Books. Retrieved November 22, 2014. ^ "2018 Annual Report and Membership Directory" (PDF). Sister Cities International. p. 47. Retrieved June 29, 2018. ^ "Interactive City Directory". Sister Cities International. Archived from the original on 2016-08-16. Retrieved 2016-07-07. ^ アメリカ合衆国インディアナ州グレイターラフィエット [Greater Lafayette, Indiana, United States of America] (in Japanese). City of Ōta, Gunma. Retrieved 20 June 2016. Wikimedia Commons has media related to Lafayette, Indiana.